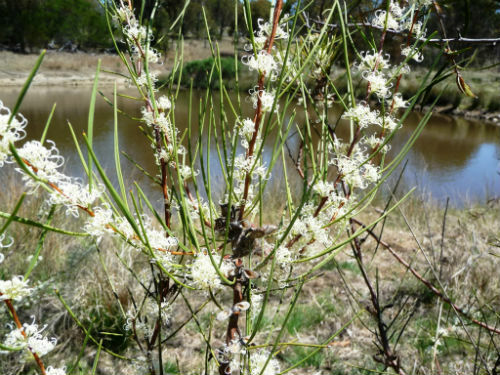 Hakea microcarpa, Small-fruited Hakea, is an upright shrub that will reach a height of 1.5 metres. Terete (circular in cross-section) leaves are up to 11 centimetres long and terminate in a sharp point. Sometimes plants carry a few flat leaves. Clusters of white flowers are carried at the base of the leaves and appear in late spring and early summer. Small woody fruits open at maturity and release two winged seeds. The wings aid dispersal by being carried form the parent plant by the wind. Small-fruited Hakea has a wide distribution and is found in all mainland states, including Tasmania. The species is found in wetlands and woodlands. H. microcarpa, when growing in swampy areas, is usually taller than the other inhabitants. In the flowering season they stand like white beacons above the surrounding vegetation. H. microcarpa could be cultivated on the margins of dams and watercourses. A group, grown close together, will create a nesting site for small native birds. The type was collected at Port Dalrymple, Tasmania in 1804 and named in 1810. The species name refers to the small fruits.